Flying squirrels are the most nocturnal and arboreal of the tree squirrels. 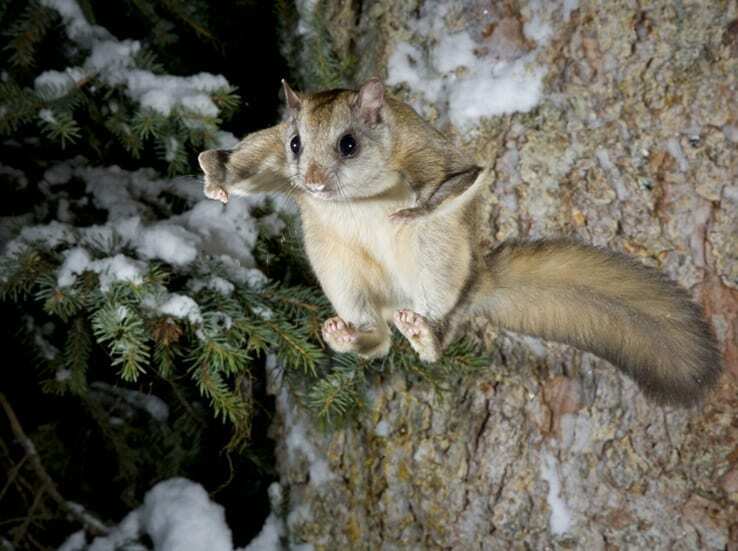 Although they forage on the ground, flying squirrels spend most of their time in trees, where they climb, walk, or run along branches, hopping over obstacles. The flying squirrels ability to glide from one tree to another is unique among rodents. Before gliding, a flying squirrel bobs and rotates the head, perhaps to gauge the route, and then leaps from a high perch, the feet and cartilaginous spurs extended to stretch the membranes. The airborne rodent sails forward and downward, twisting and turning to avoid branches, the changes in direction aided by a tail which serves as a rudder. Just as it nears the destination, the flying squirrel gives an upward jerk of the tail to land, head upward. Fleshy pads on the feet cushion the shock of impact, and sharp claws clasp the bark. By climbing onto a higher perch, a flying squirrel can glide to a different tree. A single glide usually covers about 10 m (30 ft), but when initiated from a tall tree and oriented downslope, may extend 80 m (270 ft).